The College Art Association has been invited to speak about its Code of Best Practices in Fair Use for the Visual Arts at two conferences taking place in France in early June. On June 4 in Fontainebleau, executive director Hunter O’Hanian will participate in a session on “Fair Use and Open Content” at the seventh annual Festival of Art History, along with speakers from the Paul Mellon Center for Studies in British Art (UK), the J. Paul Getty Trust, and the French Institut National d’Histoire de l’Art. 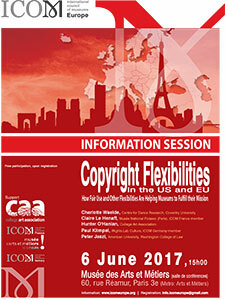 Both conferences provide opportunities for CAA to share its work on fair use with EU visual arts professionals. Though this feature of copyright law is virtually unique to the United States, there is increasing interest in Europe to provide greater access to copyrighted materials, especially in the cultural sectors of these countries. Travel costs for CAA’s participation are underwritten by a generous grant from the Samuel H. Kress Foundation.